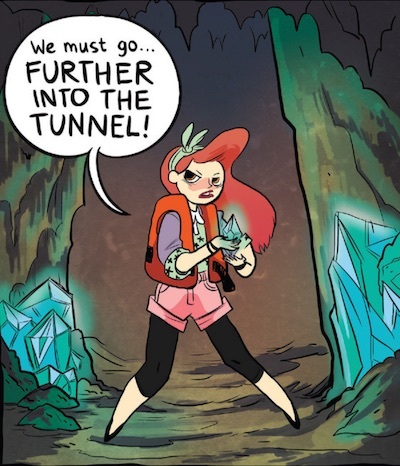 April of the Lumberjanes, charging into the darkness. I sit up in bed a moment after my alarm goes off. This is a tiny habit I’ve been cultivating for a week now: sit up and get out of bed when the alarm rings. It is starting to stick. I get ready and walk to the train. It’s not raining right now, so I don’t need to have my umbrella open. Umbrellas are so cumbersome. When the train brings us to its final station in the city, I walk west a couple of blocks, to one of the coffee shops around where our office will soon be. It is a pleasant walk, despite the lack of a proper sidewalk on this side of the street. I get to the cafe, order my cappuccino, sit down and start writing. Or at least start thinking about starting to write. And then I’m thinking about how I’m thinking about writing instead of writing. My heart rate goes up, I start feeling too warm. I’d like to write about my struggles with writing. About the fear that grips me when imagine myself sitting down and drafting a short piece, a blog post, something that is meant to be fun and unassuming, something for myself. I want to talk about how the resident gremlins pop up right away, uninvited: but you can’t write anyway, and your English isn’t great, and besides why do you want to put your thoughts out there, nobody cares, plus you don’t have anything that interesting to say, who are you fooling, this is a waste of time, the most likely outcome is that people will laugh at you, just eat a pastry or three and stop kidding yourself. We’re told to recognize these inner critical voices, recognize them for something that is not “us”, not “reality”. I know this, but it isn’t helping me right now. I’m still anxious, afraid of the consequences of putting some words out there, afraid of whatever I say never getting deleted, forgotten, forgiven. It feels vulnerable and irreversible. But I promised Dani I would write something, so I keep typing. My desire to write is about a few things. It is about clarifying my thinking, speaking out loud, sharing what I learn, practicing the writing itself. There is also a component of wanting to reach out, to connect with others, to share with fellow humans what’s on my mind and in my heart. Maybe that is why it is scary. What if I reach out and there is nobody on the other side? What if they judge me? What if I’m wrong, or if I want to change my mind later? What if it is no good? What if I regret it? What if they laugh me off? Such is life, I suppose. The reality of the human condition and all that. We have to take risks if we want to become more ourselves, grow, learn, connect. I want to take this risk, and I promised I would try. So here I am doing just that. Whatever happens, I’ll learn something from this. I’ll use those lessons to iterate and figure out a better way for next time.